I passed the OCA 8 exam about two months ago with 92%. 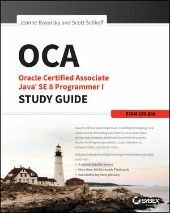 I used the OCA: Oracle Certified Associate Java SE 8 Programmer I Study Guide: Exam 1Z0-808 by Jeanne Boyarsky & Scott Selikoff. While studying I did not use an IDE. While reading the book I tried to write example code to test each thing I learned. I also tried to always ask "what happens when I change this?" to learn some of the edge cases. I wrote a summary of all the things that where new to me. After I completed the book I used the Enthuware mock exams to prepare myself for the test. I read my summary before take each mock exam. I scored pretty bad on the first one, I knew I had to learn and practice a bit more. On the later mock exams I was scoring around 80% then I took the real exam and scored 92%. I would recommend using the book and the Enthuware mock exams both helped me a lot in preparing for the exam. In total it took me about 2 - 3 months. I'm currently preparing to take the OCP exam. Congratulations! That's an excellent score! If it's not too much trouble, would you mind writing an Amazin review for our book? It may help other people searching for material. Sure Scott I submitted my review on the Amazon site. Glad to now that our s/w was helpful in your preparation. Thanks Robbie! And good luck on the OCP exam!